Migraine symptoms can be extremely painful. If you have never had one, you are lucky. Migraine symptoms consist of debilitating head pain, nausea, vomiting, and sensitivity to sounds and light. In extreme cases, one can feel weakness on one side of the body that can last minutes to days. Some people never get head pain; rather they have problems with vision such as an aura around everything (ocular migraine symptom), stomach pain (abdominal migraine), or some other unexplained phenomenon. An article in the Sunday NY Times provides a bit of a first person account of migraines. Natural migraine treatment requires us to know the cause. I have identified at least 9 different causes of migraines. Likely there are more than the nine. Let’s explore the causes of the migraines and possible treatments such as LENS Neurofeedback. Before we jump into the categories of migraines, I just want to give a brief overview of the scope of the problem. Estimates vary between 10-20% of the US population suffers from migraine symptoms. It costs consumers approximately $12.7 billion a year in medical costs plus another $12 billion in missed workdays. People who suffer from migraine headaches make less money than people who don’t. Not only that, people who get migraines are at a greater risk of heart attack and stroke. Traditional medicine manages migraines headache symptoms with polypharmacy, or the use of multiple drugs. While providing relief, many of this drugs have side effects too. Determining triggers can help reduce the frequency of migraines. Chocolate, alcohol, caffeine, menses and barometric changes are some of the common ones. 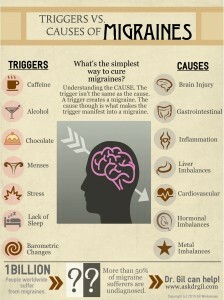 A trigger creates a migraine but isn’t necessarily the cause. The cause though is what makes the trigger manifest into a migraine. Not everyone who eats chocolate gets a migraine. For those who are susceptible to migraines, chocolate can create one. By the cause, I mean what is it that allows a trigger to work. Stress and a lack of sleep may also affect people. The trigger though, isn’t the same as the cause. I work with people to help them understand triggers because it can bring relief. Then we find the underlying cause so they don’t get sick again. Many of my patients tolerate the thing that made them ill previously. They start to live their life more fully. Understanding the cause is the simple way to cure migraines. Finding the cause is not always so easy. Let’s explore some of the different causes. Traumatic Brain Injury (TBI): One of the most common causes of migraines is previous head trauma. I discuss the details of head trauma in the last post. Head injury is common and can cause migraines. Even minor bumps on the head or whiplash injuries can add up and lead to headaches later in life. In the last post, I go over the treatments in this situation. Female Hormonal Imbalances: Many women get migraines related to their menstrual cycle. The headaches can occur right before or when their menses start. While this can be its own cause, it is usually related to liver imbalances. Treatment requires balancing of the hormones first. Ensuring that the cycles are regular is the first thing I do in this case. More often than not, though, it requires looking at the liver. Liver Imbalance: Liver imbalance is common for people with migraines. The liver clears toxins from the body, and hormones are no exception. But other imbalances can occur too. The inability to eat rich foods or drink alcohol without a problem maybe a sign of a liver issue. The way I describe this issue to patients is that their liver cells just aren’t working as liver cells. Naturopathic treatments remind the liver cells how to do their job. Our DNA is more of a blueprint than a hardcoding. The body has flexibility in what it produces. If the liver isn’t doing its job, it means it’s not producing the proper proteins to be doing its job. I use a variety of supplements that assist the liver and others that work to reset the epigenetic state. Gemmotherapy, homoepathy, and low dose botanicals can all help with the liver. Gastrointestinal: This is distinct from a liver problem. Sometimes, there is a problem with the foods we eat because we aren’t digesting them. This could be due to food sensitivities causing GI distress. For reasons unknown, this can lead to migraines. Changes in the healthy flora in the intestines can lead to this issue. These organisms help protect the gut and allow us to digest food well. The reason why so many people react to so many foods is that the gut is too loose. Leaky gut is a real problem, and one of its symptoms is migraine. Small Intestinal Bacterial Overgrowth or SIBO can be the culprit too. Proper diagnosis of this problem starts with an elimination diet. If the problem isn’t completely resolved, then I run other tests. SIBO, Leaky Gut, Irritable Bowel Syndrome, and Crohn’s can all be causes of migraines. Treatment varies based on the diagnosis. Hormonal: Other hormonal imbalances can lead to migraines. Adrenal imbalances causing rapid changes in cortisol or epinephrine can cause migraines. The adrenal gland is also responsible for instructing the liver to produce certain proteins. Sometimes the liver is fine but the adrenals aren’t directing it appropriately. Or the thyroid may be out of balance. An imbalance in either could disrupt sleep, and fatigue is a common trigger for migraines. Metal Imbalance: This is a new one for me although the research about this is almost 30 years old. The main culprits here are Zinc and Copper. The body requires both metals for proper functioning. In general, Americans are low in zinc and high in copper. This may be due to the effects of food processing, but it is unclear why. High copper levels may cause both migraines and menstrual difficulties. It also exacerbates low zinc. Zinc supplementation has shown promise in research studies as a treatment for migraines. (Med Hypotheses. 2011 Jul;77(1):147-51. A new horizon into the pathobiology, etiology and treatment of migraine. Dillion, Singh, Lvall) Simple testing of blood and/or hair can help reveal this issue. Zinc supplementation can be effective for raising zinc levels. Vitamin E and other nutrients can lower copper levels. Heavy Metals: Another issue with metals is the heavy variety. 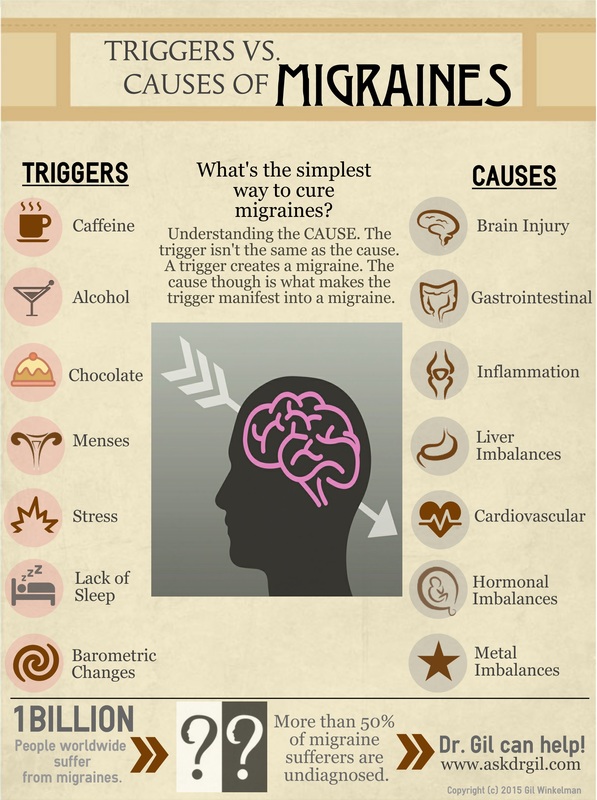 Mercury, cadmium, arsenic, and aluminum can all contribute to migraines. Heavy metals can come from a variety of sources, and often the headaches come on as the body is trying to get rid of them. Elimination of metals needs to be gradual to prevent severe symptoms. A simple mineral prescription can start to mobilize the offending metals out of the body. Headaches will be completely gone in months. Inflammation: Inflammation is starting to gain traction as a cause of many different conditions. Recent publications have suggested that migraines may be inflammatory. What does this mean? Inflammation is the process the body uses to heal damage. It is to be a short-term activity to do so. Cells release hormones called cytokines that are signals to repair damage. These make us feel achy, sluggish, and depressed. For various reasons, the body sometimes gets into a chronic inflammatory state. This means that the entire body feels down, as if ill. In some people, the inflammation leads to headaches. The reasons aren’t completely clear. Treatment would consist of lowering inflammation in the body. This is probably a good idea for most people. An anti-inflammatory diet, omega-3’s (fish oil), and turmeric are simple ways to reduce inflammation. Cardiovascular: Changes in arterial pressure may also contribute to migraines. In this situation the pain doesn’t start with stress but when there is relaxation. Patients get migraines on the weekend or on vacation. What is interesting is that some of these patients may have had asthma earlier in life. There appears to be changes in the autonomic nervous system affecting the arteries. Another issue that can arise is that the person with migraines has a small hole in their heart. We have no idea what the relationship is between the two and it is somewhat rare. Treatment here definitely varies depending upon the situation. Neurofeedback or biofeedback can be helpful to stabilize the nervous system. These are some of the causes of migraine. Others exist, of course, but these are the ones that I see most commonly in my practice. As you can see, it is a complex problem, and just treating the symptoms won’t change the issue. Treating the underlying cause helps reduce the problem. If you or someone you love suffers from migraines, please call me. I have a Naturopathic practice in Portland but can work with people remotely using Skype or telemedicine. While my I delight in helping people. And maybe you too can one day be migraine free. Jason’s parents brought him to my clinic because of violent behavior. (I am not using anyone’s real name.) Several suspensions from school alerted his parents there may be a problem. But it was his punching a hole in the wall of his bedroom that led to the call to me. Lisa’s anxiety became so debilitating that she didn’t want to leave her house. By the time she called to make an appointment, she had confined herself to only her room and the adjoining bathroom. Clark’s sudden mood swings correlated with depression and not knowing what he wanted to do with his life. Though very smart and done well in school, Clark was currently underemployed. His mom convinced him to see me. We sent pyroluria test kits to all three of these patients, and I knew the results would be positive. 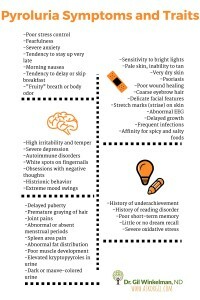 While depression, anxiety, oppositional defiance disorder (ODD), and reactive attachment disorder (RAD) may arise from different causes, pyroluria should be ruled out as the cause of these and other mental health problems. Testing is easy to do at home. The lab sends a pyroluria test kit; the sample is collected and sent back to the lab. After Jason’s mom called, we had results within two weeks, and I developed a treatment plan of vitamins and minerals ready for Jason. Jason is not unusual. I have treated hundreds of people with pyroluria over the last seven years with great success. A pyroluria test kit is inexpensive and easy to do. Pyrrole supplements cost little and are simple to take. If that is the only imbalance in the body, we see changes in the person within a month. What exactly is pyroluria? Confusion abounds as to how to explain pyroluria or Pyrrole Disorder. Other names include Mauve Factor and Kryptopyroluria. Many doctors do not recognize the clinical significance of pyrrole disorder. Though I didn’t learn about it in medical school, I can assure you that pyroluria is real. Kryptopyrroles seem to appear under conditions of oxidative stress in the body. The body produces an unusable form of the part of the red blood cell that holds the oxygen, called a heme-ring. This molecule, harmless in most people, will deplete the body of nutrients such as zinc, vitamin B6, and gamma-linolenic acid (GLA) in others. People who have pyroluria be in normal range for these nutrients in their blood tests but still have symptoms. What are some of the symptoms? The chart below shows the effects of pyrrole disorder. You only have to have two or three to be positive. Oddly, there isn’t always a correlation between symptoms and amount of pyrroles. I have seen patients with extremely high numbers but few signs and patients with lots of symptoms and a low kryptopyrrole result. Over the course of the next could of articles, I’ll explain why that is. Suffice to say, pyroluria can affect different parts of the body in different ways. Why would oxidative stress lead to the creation of kryptopyrroles? The short answer is we don’t know. There are many different theories, but the one I like the best is trauma. Early childhood trauma seems to be a commonality of people with this condition. Pyrrole disorder and oxidative stress, in general, seems to be a physiologic response to emotional or physical trauma. Jason’s parents adopted him as a baby. Early childhood wounding contributed to his behavior. Pyroluria may be a clue to mind-body connections; the bridge between the trauma that one experiences when younger and the physical symptoms that occur later in life. A diagnosis doesn’t mean that psychotherapy is unnecessary, but it can make it more successful. You too can get help. If you or a loved one has some of the symptoms listed, call or email us today. We will be happy to send out a pyroluria test kit and consult about the results, which we can do via an online doctor consultation. Pyrrole supplements can be life-changing. We’d be happy to help facilitate moving you into a happier place. Though the patients mentioned in this article had an easy time with treatment, not everyone does. The next article will discuss some of the pitfalls of self-treatment. Online doctor consultations are becoming more popular. And why not? Patients don’t have to travel to the office, park the car, and wait for the doctor. You can stay in the comfort of your home and consult with the doctor through your computer or phone. But are online doctor appointments good for everyone? Not likely. But for many people, virtual medical visits provide a simple approach to medical care. Let’s explore what online doctor consultations look like with Dr. Gil and what sort of conditions are appropriate for treatment. Dr. Gil has been using telehealth services for mental health for many years. The process begins with either a phone call or email and determine if labs need ordering. If you have the correct labs run relatively recently, there’s no need to repeat them just yet. Sometimes Dr. Gil orders additional labs, especially if you attempted similar treatments that didn’t work or only had partial results. Labwork performed by other providers may be reviewed before your appointment. Labs aren’t required for every patient before the first appointment but can expedite the treatment process. For most patients in the US, we can arrange for the lab collection to occur near your location. Outside the US, some results are challenging but not impossible to obtain. The office staff assists as best it can to help you get what is required. Before the appointment, you will fill out an extensive questionnaire that combined with the lab results helps Dr. Gil uncover possible causes of the ailment. The first appointment lasts up to an hour whereby Dr. Gil comes up with a treatment plan for your condition. You can merely order the vitamin and supplements from Dr. Gil’s medicinary or obtain through another source. Insurance may or may not cover telemedicine visits but may reimburse the lab fees. Check with us first about whether coverage is possible. Neurofeedback services typically require appointments to be in-person. Demand for online doctor visits has increased as patients discover its advantages. Find out for yourself how easy it is to get help for you or your family member. Schedule today for a free pre-consultation. Pyroluria is more common than previously though. Pyro-what? What is this disease? The word pyroluria is a combination of pyrrole and urine. It refers to a molecule that shows up in the urine in most people. There are different things that can cause pyroluria. For many people, pyroluria treatment can be life changing. And many kids with Reactive Attachment Disorder or RAD Disorder have pyroluria. Behavior problems can disappear with simple natural treatments. Pyrrole Disorder symptoms are diverse. Let’s explore what pyrrole disorder is and what the symptoms look like. Genetics. Pyroluria does seem to run in families. I have tested kids who are siblings where both have had it many times. But not all the time. If a relative suffered from depression, schizophrenia, bipolar disorder, alcholism, or another mental health condition, get tested. Childhood Trauma. There may be an epigenetic component to the condition. Trauma may cause a rise in inflammation in the body and lead to this condition. Chronic infection. It is difficult to know if the problem exists because of the infection or if the lack of zinc leads to poor immunity. Alcoholism of the sufferer or parents. Environmental toxicity. Heavy metal poisoning in particular could play a factor in the cause of pyroluria. Processed foods. A standard American diet of processed foods and sugar can stress the body out and lead to absorption problems. Stress may be a trigger to pyroluria or it could be a result of it. It is not clear at the moment. What are Pyrrole Disorder Symptoms? Pyroluria has some distinct symptoms. I have a questionnaire that helps people determine if they have the condition. Most of the symptoms that I see in my practice revolve around mental health problems. But many people experience problems with other areas of the body. Let’s start with the mental health symptoms first though. Mentally, people feel stressed. There is a high amount of severe inner tension or anxiety. Tolerance to stress is low. For example, someone who easily stresses out with minimal traffic may have pyroluria. Social withdrawal is common as is sensitivity to crowds. But more severe mental health symptoms exist too. There can be periods of mild to severe depression followed by hyperactivity. Episodic anger outbursts or other mood swings are common. Panica attacks or severe anxiety. They may enjoy an argument but be upset by criticism. In severe cases, pyrolurics may hallucinate or have delusion disorder. Fatigue easily likely due to nervous exhaustion. Blood sugar control. There may be hypoglycemia with blood sugar drops. Morning nausea and poor appetite in the morning. They may skip breakfast. There are some people who have few of these symptoms but may still have pyroluria. You may have done blood work for zinc for example and shown that it is normal but still have symptoms of zinc deficiency. This is typically caused by pyrrole disorder. So what can you do? My article about pyroluria gives suggestions but the short answer is get tested! I can do pyroluria testing and help develop a custom treatment plan via telemedicine services. Call today to learn more. I get many calls from people all over the world asking if I can help them. They or their loved ones have different problems. Anxiety, ADD, oppositional defiance, OCD, RAD, autism, and depression are some of those problems. They want to know if can I help them using a natural approach without their coming to see me in Portland, Oregon. Do I offer telemedicine services? The short answer is, sometimes, yes! Insurance may or may not cover it. And I have certain restrictions on how I can help, for sure. But telemedicine is the wave of the future, and may be a good approach for many people. What does this process look like? Telemedicine services or telepsychiatry is like having an in-person appointment. We can have our appointment on the phone or via HIPAA-compliant video. For most of the diagnoses and/or symptoms I listed above, telemedicine works great. You schedule an appointment and fill out the paperwork. I review the paperwork before the appointment. I have you get labs based on the Walsh Protocol to find what the imbalance may be. Any imbalance found allows me to treat with supplements. Telemedicine services are a great option for many patients. Most of my patients don’t live in places that have access to alternative providers. And my approach is truly unique. I have seen amazing progress with patients using “just” nutrient therapy. It’s not just taking a bunch of random supplements. It’s a targeted approach to balancing out the body. The combination of the intake paperwork and labs helps me determine the right supplements. In general, we do follow-up appointments every 4-6 weeks, depending upon the case, to make sure you are progressing well. There are many things, though, that I cannot treat using telemedicine without another doctor’s help. In these cases, I can act as a health consultant. Any time a physical exam is required, you will need to visit your local physician. For example, many digestive ailments need a physical exam and/or imaging for proper diagnosis. While I can assist with naturopathic treatments using telemedicine services, I likely couldn’t diagnose. Some patients may also need neurofeedback or other services. These require a trip to my office or seeing a local provider. In some cases, I can give a referral depending upon where you live. Also, sometimes other natural therapies are required to treat the problem. In this case, I have other approaches such as biotherapeutic drainage and botanical medicine to assist you. Find out more about telehealth services for mental health and whether they are right for you or your family member. Call my office today. As a Naturopathic Physician, I get many questions about diet and detox. The most common question I get is around diet with autistic children and adults. Diet plays a major role in autism treatment. Why does this diet work with this child with autism but not this other one? The answer to this question applies to more than just autism. People are often confused about why a new diet may stop working after some time. When they first start it, they feel good but after some time, they notice that nothing changes. Or they tried it one time and it helped, but another time the same diet change didn’t help. What’s going on? In this post, I want to explore these questions and discuss the factors that may contribute to this. I started working with people diagnosed with Autism a few years into my practice. Autism is either a series of conditions or one condition with different causes. It presents in many ways based on the person. I started using LENS neurofeedback in my practice in 2009. I had one child with Autism respond immediately to the treatment. After that, I had many children and adults with Autism come to see me. I ask all new patients about diet. With Autistic children, the parents had tried many different diets. Gluten-free, casein-free, specific-carbohydrate diet, phenol-free, and others were all tried by different people. Sometimes they worked, sometimes they didn’t. The Autism Research Institute has a chart that shows the efficacy of different diets. What was interesting to me was that some of the diets helped some of the people some of the time. There wasn’t any one diet that worked with everyone. And some people found specific improvements with one diet but not another. Some patients, for example, found that sensitivity to noises improved with gluten-free diets. But they saw no change in sensitivity to touch with the same diet. It was curious. SIDE NOTE: If you look at the chart carefully, there is a column that shows the ratio of better:worse. The ratio on average is much higher for alternative treatments than for pharmacological treatments. The only pharmacological treatment that shows promise at this time is the IVIG therapy. It is a therapy used to boost the immune system. The chart doesn’t evaluate neurofeedback. What his book doesn’t cover in detail is epigenetics. I have created a podcast about this, but want to explain more here. Epigenetics is the science of how the environment affects our DNA expression. What we eat, drink, breathe, and experience changes how our cells turn processes on and off. There is a relatively new field called nutrigenomics that explores how what we eat can change our DNA function. Research suggests that diet has a big impact on the function of DNA. In mouse studies, researchers observe physical changes in mice with unhealthy diets. Traits like diabetes are then passed to successive generations. This transmission occurs even if the mother changes her diet back to the healthy diet. An intervention like supplementation can restore function. (this part is confusing) It’s amazing. What does this have to do with Autism? Autism is most likely not a genetic disease but an epigenetic one. Dietary changes can reduce symptoms, but in most cases doesn’t cause a complete reversal. In general, I find that supplementation and dietary changes together are more effective. This could be why my patients of complain that a simple diet shift stops helping. They need more than just a shift in diet. This isn’t to say that you shouldn’t change your diet if it’s not healthy! But we shouldn’t expect that by itself to always fix the problem. Other factors may be part of this situation and I will cover those issues in another blog post. For now, remember that diet is part of the solution for autism treatment and other issues. But there are other aspects that are important in total health. If you want to learn more, feel free to schedule an appointment with me. The yoga studio I go to has different teachers that teach classes for students of all levels. It is unusual, as there is a mix of advanced students and beginning ones in the same class. Last week, one of the teachers had us do a lot of planks. This is a core building exercise that requires the yogi to hold the pose as if doing a pushup – at the top of the pushup – sometimes for several minutes. After the class, I had a discussion with another student about all of the planks. “It’s not that the pose is physically hard to hold for that long,” she said to me. “It’s that my mind has trouble holding the pose.” It was a curious comment. What is it about doing something painful that is hard? Why do we have trouble pushing through the sensation? In this post, I want to discuss how one holds emotions in the body. Emotional healing is an important aspect of physical healing, and an important part of my practice. But how do we release emotions? Why do they come out at times when we don’t expect them to appear? This is an aspect of my medical practice that fascinates me, and the answer isn’t clear. The simple answer is, when the person is ready. There are many techniques to release this storehouse of emotions, and we can explore some of them. I think most people would agree that stress is held in the body. It’s something that one can feel and experience. Many people feel the effects of a long day at work in their neck or shoulders. But there is a deeper issue that can happen where trauma and grief are stored in the body. I have worked with many patients who have discussed this phenomenon as part of their work with me. Many report breaking down in tears while exercising as something shifted within their body. Emotions stored are released as part of the healing process. How do we access these emotions physically? Candace Pert was a molecular biologist who studied the mind-body connection. She discovered that the body synthesized tiny molecules in response to difficult emotions. These get deposited into various places in the body. She and other scientists proposed that the body is a storehouse of unconscious thoughts and feelings. All of the things that have happened to us are stored in our bodies in response, regardless of whether we recall them or not. Why is yoga so helpful for clearing negative emotions? Yoga, as an exercise, focuses on three things: movement, breath, and awareness. These three components play out in many of the techniques used to release emotions. When most people think of yoga, they are thinking about the exercise. Yoga is actually a series of practices that include Hatha Yoga, a series of poses. These poses are either done individually or in a sequence called a vinyasa. Each pose, or asana, has a specific breathing rhythm associated with it. The transitions between asanas also have a breathing pattern. There is a synchronization between the breath and the movement. The breath is part of the ritual and allows for a cleansing of the mind, body, and emotions. The practice requires awareness and focus. One may become aware of the places that are stuck and painful. Many yoga teachers say that yoga begins when one wants to move out of a pose or quit. Bringing attention to the discomfort can help release the pain. The awareness requires non-judgement. It is what a Buddhist would call “Mindfulness.” Mindfulness is awareness without struggle. It is pure acceptance of what is. It is about being with what is true for you in that moment. You accept the feeling, the pain, the experience. And by doing that, the discomfort magically begins to soften. It is as if we have given our bodies permission to let go. Yoga is such a wonderful metaphor for the process of letting go. I suspect that many people benefit from yoga because there is a visceral experience. You can feel where you are stuck and release that tension. You feel the struggle in your body. For example, let’s say you’re trying to stretch your hamstrings. There’s a quality of softening you must embrace to do so. Otherwise you are just tearing at the muscle fibers. You learn to let go. Doing this on a psychological level, though, isn’t always as easy. This is because we have a different type of block called a “defense.” We still have the same struggle. It’s just happening in our minds. Psychologists tell us that we have defenses for a reason. We build defenses as a way to protect ourselves. They may be hiding trauma, abuse, or shame. We create them because at the time they form, we don’t have the emotional capacity to process what is going on. The defense becomes a part of us and we begin to identify with it. It is analagous to the tight hamstrings. We don’t remember when the last time the legs were loose. To move around defenses, psychologists have created various methods. Emotional healing techniques allow us to access these parts of ourselves. Talk therapy helps us see our defenses. We gain greater awareness and can change our typical response. Other techniques focus not so much on the spoken word, but some sort of visceral release. Eye Movement Desensitization and Reprocessing (EMDR) is a technique that helps patients process trauma. Emotional Freedom Technique or EFT uses a self-tapping pattern while recalling a specific event. Both of these techniques appear to allow for the body to reprocess the events on a cellular level. While we don’t always recall the specifics, release of the event is possible. These methods suggest that there is a connection between our minds and our body. Memories are stored in the body and accessed through the brain. But the use of these techniques allows us to move around our blocks. We don’t always have to recall a specific incident. (Although both the above techniques require one to do so.) A specific event isn’t always recalled while doing yoga. It arises out of the breathing and the movement. In my medical practice, understanding this is crucial, as so many people come to me with anxiety. Very often, anxiety strikes and is free floating. There is no easily identifiable event or experience that one can identify. Focus on the past is less important. Focus on the present is key. It is where the defense lives. It is where the body lives. A method that I use in my office works on a different principle of mind-body connection. HeartMath is a form of biofeedback that uses heart rate to help the user relax. It’s more than relaxation though. It helps the person see on the screen how their body reacts to different types of thoughts. Calming thoughts help bring the body in a state of coherence or where different systems in the body work together. Negative thoughts bring the body out of coherence. Watching this on the screen allows the user to learn to breathe better to gain more coherence. HeartMath works by helping the user stay in the present and notice subtle changes in their body. Emotional healing during yoga is a great illustration of a mind-body connection. The body remembers even if we don’t. But there really isn’t a distinction. Our body knows, and it keeps track. From the mild aches and pains we feel getting up in the morning to full-blown disease, our bodies remember.